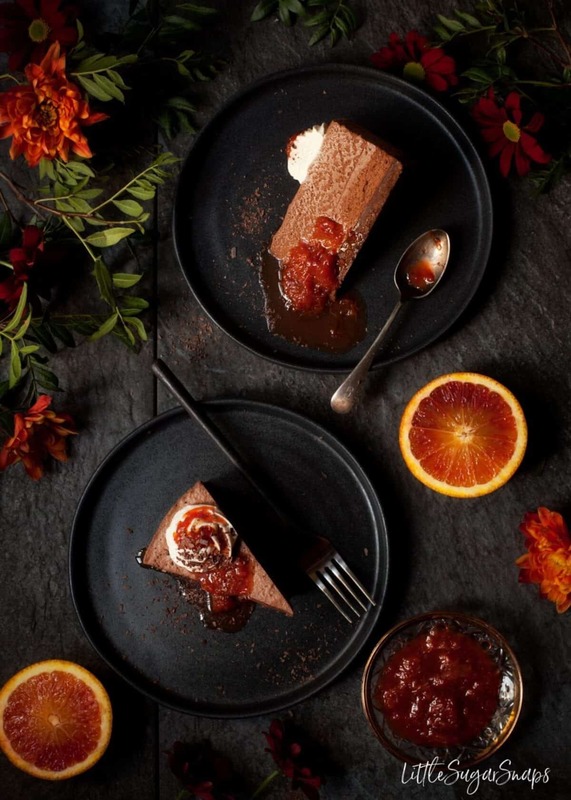 Make the most of winter citrus fruit by serving up this heavenly Cinnamon Chocolate Mousse Cake with a spoonful of intensely fruity blood orange compote. 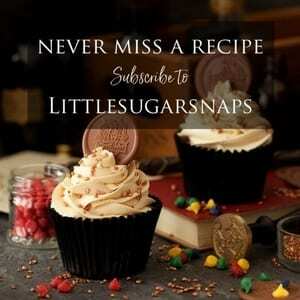 This easy no-bake dessert feeds a crowd and packs a hefty flavour punch. I know that last time I promised you a marzipan cake, but well, as you can see, I break my promises. 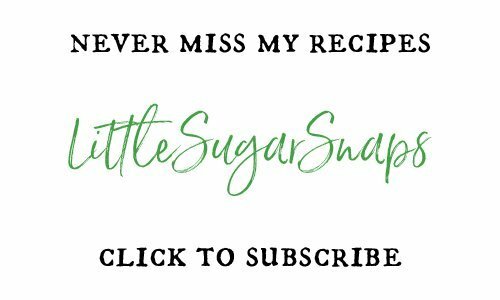 Every so often it’s necessary to bump a recipe to make way for something that cannot wait. And the reason behind the sudden urgency for my recipe today is blood oranges. Blood oranges have such a short season and we must be at least half way through that time already. 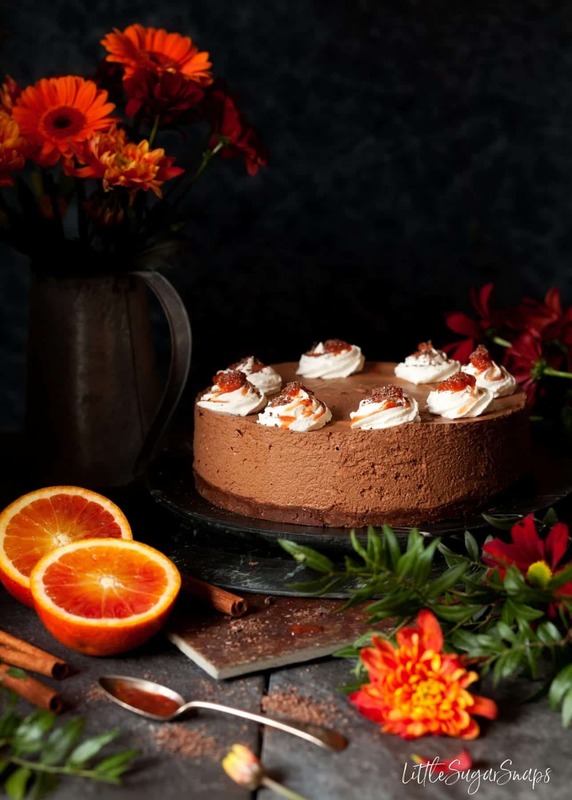 Blood oranges make all the difference to this indulgent and intense Cinnamon Chocolate Mousse Cake. The sharp, tangy nature of the blood orange compote smoothly cuts through the rich & creamy nature of this chocolate dessert. And of course, the beautiful colour looks stunning against the dark tones of the cake. 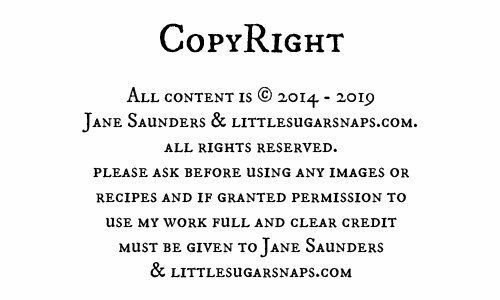 A smidge of compote is all that is required in each spoonful to transform this dessert completely without overpowering it. 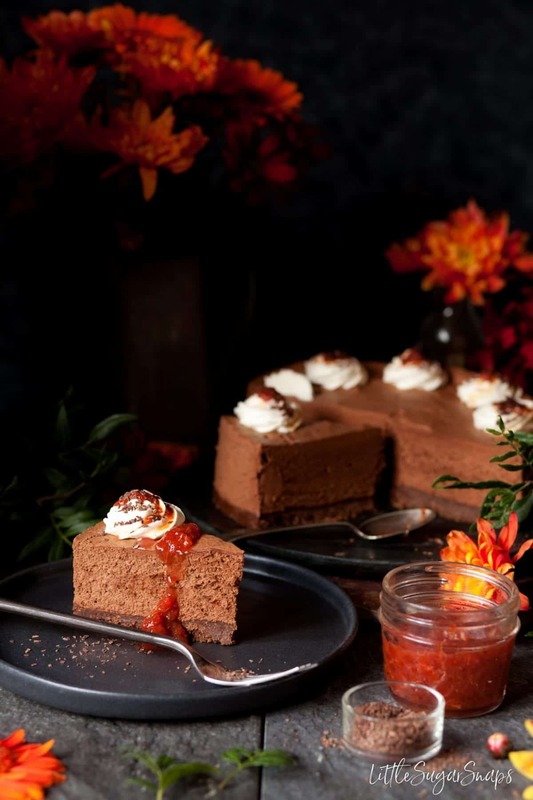 Making this Cinnamon Chocolate Mousse Cake is relatively straightforward and it’s no-bake. The base is a simple biscuit crumb enhanced with chocolate, cinnamon and zest from a blood orange. The top layer is a vegetarian friendly chocolate mousse – there’s no gelatine involved in this recipe. 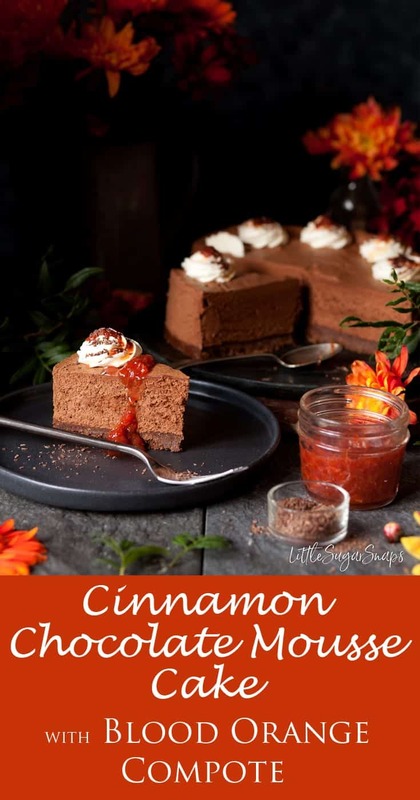 But the mousse has been spiked with cinnamon, since it pairs excellently with both chocolate & orange and it adds just a hint of warmth with seems fitting during the winter months. The blood orange compote is vibrant in colour and intense in flavour. I recommend taking the time to segment the orange to fully remove all pith. If, like me, this will be the first time you prepare an orange in this way and you need some guidance, head over to The Watering Mouth for a video tutorial. I won’t lie – segmenting an orange is a little messy, but the result is well worth the effort. 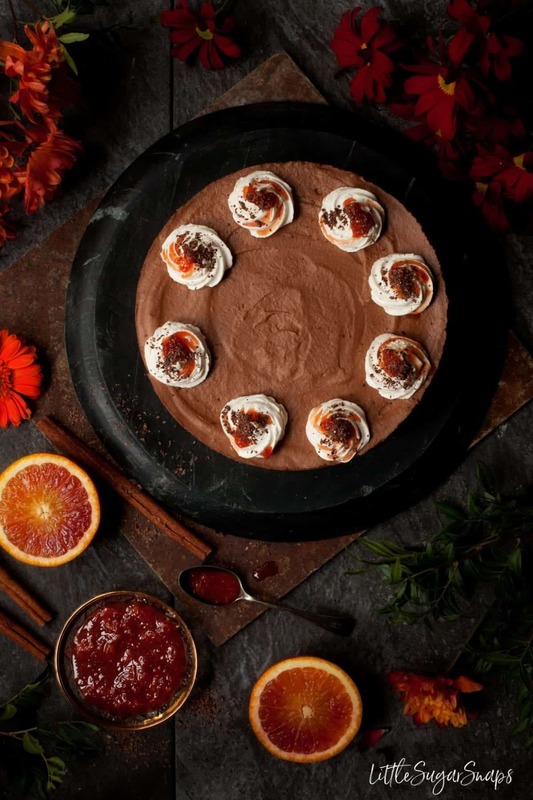 I’ve chosen to decorate this Cinnamon Chocolate Mousse Cake simply – with a swirl of cream, a drizzle of compote and a few chocolate flakes. Sometimes less is more. 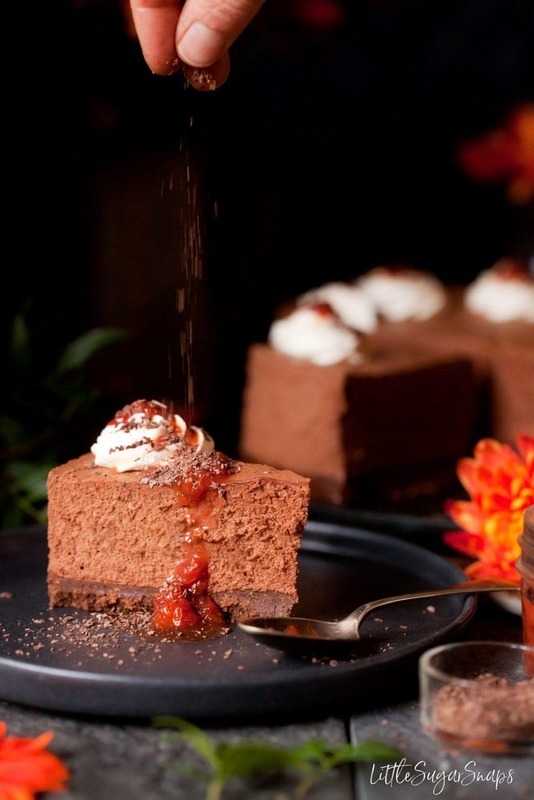 Since this Cinnamon Chocolate Mousse Cake is so intense, this delectable dessert will serve plenty of people – at least 10, possibly more, depending how greedy your guests are feeling. And of course, should blood oranges not be available near you, give it a try with regular oranges. The compote might be lighter but the dessert will still taste amazing. 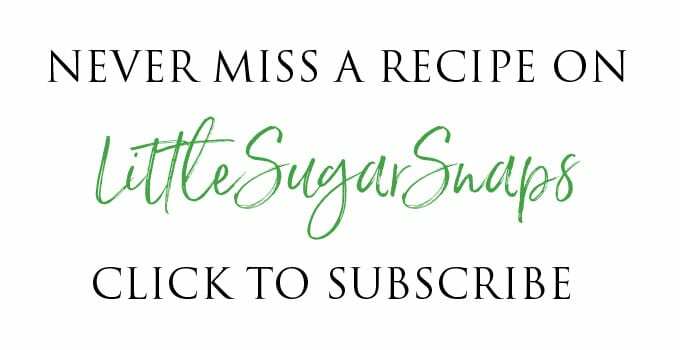 Next, beat the thickened cream into the chocolate with the balloon whisk - work quickly to avoid the chocolate setting and the mousse turning grainy. Wow this looks and sounds incredible! Chocolate and orange is such an amazing flavor combination – can’t wait to try this! Thanks Nellie – be quick, those orange are disappearing fast…. LOVE your shoot on this cake. So beautiful!! I’ll bet it tastes incredible, too. Absolutely LOVING the combo of orange and chocolate 😀 I’d totally use that compote on so many other desserts, too!